Today all of us share files from one Android to another, Android to PC or vice versa and at that moment we use many apps to transfer files and we also use Bluetooth to transfer files, but the speed of file transfer using all these is not so high. 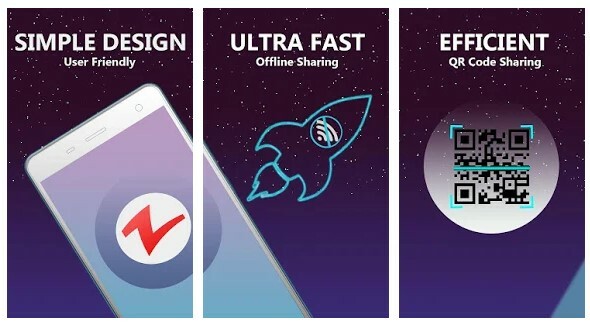 So, We are going to share few best Android apps to transfer files over WiFi with high speed, follow the full post to know about it. 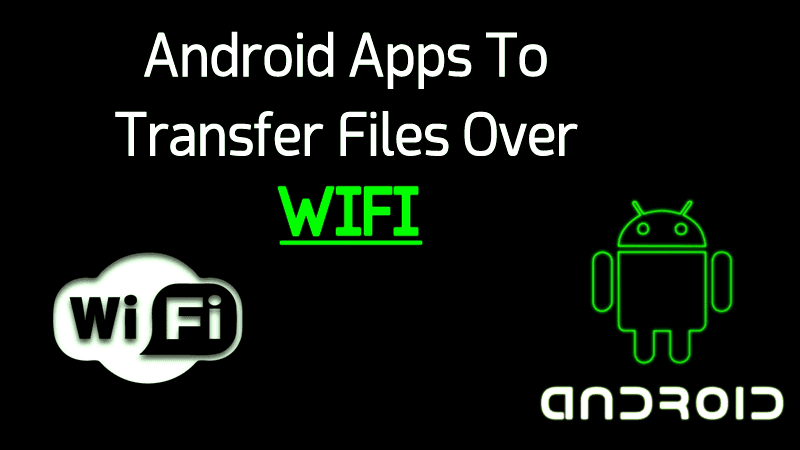 For Android users, we are here with Best Android Apps To Transfer Files With High-Speed Over WiFi. Today all of us share files from one Android to another, Android to PC or vice versa and at that moment we use many apps to transfer files and we also use Bluetooth to transfer files, but the speed of file transfer using all these is not so high. So we are here with the cool alternative by which you can transfer files over WiFi and with tremendous speed. Moreover, the speed will be somehow similar to computer file transfer speed. So have a look at the complete guide to these apps below. We have selected some of the best apps that you will surely love to have on your Android device. As these apps will help you to transfer files from one device to another with a very high data transfer speed. So have a look at these apps below. As today, most of the Android users and even iPhone users are familiar with this app. As this is the only app that lets you transfer files from Android to Android and from iPhone to Android too. The file transfer speed of this app is quite good than all other apps. You can share multiple files with multiple users using this app. So must try out this app. This is one of the best Android apps to transfer files over WiFi with high speed. 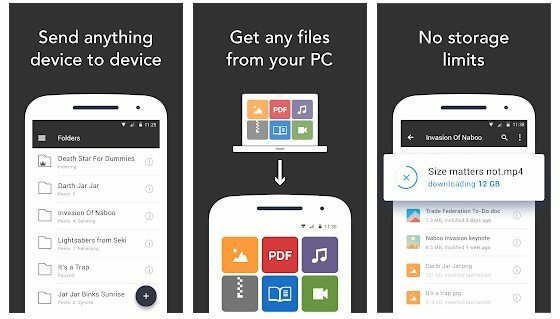 With this app, sending file anywhere becomes easy and this app allows instant file transfer with an ease. For transferring file, you just need a 6-digit key to pair devices. No Sign Up or login is required in this app and just pair the device and send data with fast speed. This is also the best app that you can use to transfer files over WiFi direct with a very high-speed data transfer. You need a pairing between devices and then you can transfer files even in Gbps with a very high transfer rate. So install the app and enjoy the fast file transfer between our Android devices. This is again the very popular app that is available for both PC and smartphones. Also, using this app, you can even transfer files from Android to PC or vice versa with a very high-speed transfer. You can send multiple files at a time and the pairing process is also quite simple and easy than other apps. This app is an advanced version of Wireless File Transfer that comes with remarkable features like Thumbnails/List view, Wireless apk installation, File Management, App Management, Search, and lots more. It’s the easiest, fastest way to send and receive files and folders from other smartphones, tablets, and computers. File Transfer works cross-platform on Mac, Windows, iPhone, iPad, iPod Touch, and Android(*). 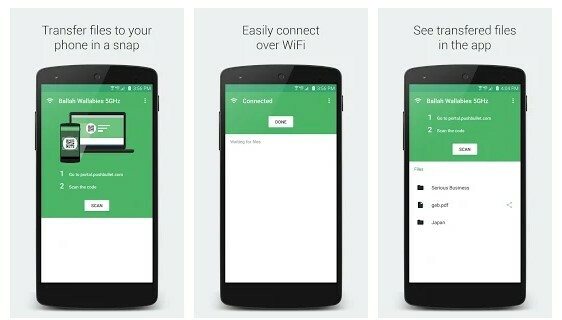 WiFiShare is an innovative mobile app which enables ad-hoc file transfer between two or more Android phones. It uses wireless hotspot technology provided by today’s phones to do file transfer and does not depend on any intermediary infrastructure. Using WiFiShare, files are transferred in few steps with a transfer speed of 1.5-2.5 MBps. This app is also for transferring files between device but slightly in a different way from other apps. 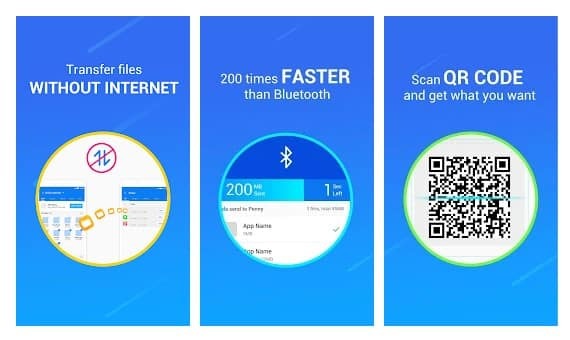 Fast File Transfer application is one of the remarkable Android applications that enhances the speed of Bluetooth by up to 17x. And with that, you can enjoy the high-speed file transfer. This cool free app will let you share files from one Android to another at the shooting speed. You can use the WiFi Direct technology to wirelessly transmit photos, videos and any file directly between two Android devices. So must try out this app on your Android device. It is one of the best apps that connects PCs to Android devices. You just need to connect both your PC and Android with the same account simultaneously and you will be able to transfer files through WiFi. Manage your files efficiently and easily with ES File Explorer (File Manager)! ES File Explorer (File Manager) is a full-featured file (Images, Music, Movies, Documents, app) manager for both local and networked use. You just need to connect two devices to the same router and you can transfer files via WiFi. 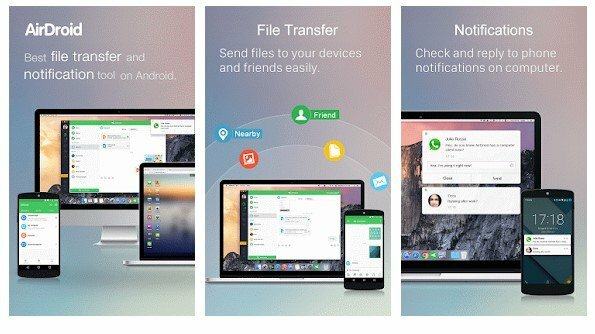 AirDroid allows you to access and manage your Android phone or tablet from Windows, Mac or the Web, wirelessly, for free. Getting pictures, videos, and other files from your computer to your phone should be quick and painless. Portal helps by making it as easy as drag and drop. WiFi File Transfer lets you upload and download files to/from your phone or tablet over a wireless connection. Easy-to-use web interface, no USB cable needed. Filedrop is a tiny and cute app for sharing things over wifi. Transfer files and photos easily. Play remote slideshow. The app is available for Windows and MAC. iShare is the fastest way to share files between Android devices with hotspot. This is fast, simple, free tool for sharing files to nearby devices by the automatically created ad-hoc link. This is another best tool which you can use to transfer files like Photos, videos, music between Android devices. The best thing is that you can send files without using data or an internet connection because it had WiFi direct support. If you are looking for an easiest and fastest way to transfer files between all devices, then you should choose Flyingfile. This mini-app supports real-time file transfer by connecting PC and mobile of the same account. You can also use the WiFi direct feature to transfer files between Android devices. With Software Data Cable, you can connect phones, PC, tablets, Mac, and TV – send contents including photos, files, folders, videos wirelessly at lightning fast speed. Users just need to turn on the WiFi and then scan the QR code to connect with other devices. Droid Over WiFi is one of the best apps which you can have if you want to transfer files over the Wifi. The app requires no wires, no drivers, no cables, no Bluetooth only WiFi on a fresh air and browser to connect your Android device with desktop or laptop or even another android device with Droid Over Wifi app installed. Feem is another best Android app which you can use to transfer file wirelessly. The best thing about Feem is that it brings tons of other features apart from just sharing files. For example, you can transfer almost all file types with Feem. So, Feem for Android is another best app which you can use to transfer files over WiFi at high speed. Resilio Sync is another popular file sharing app which you can have on your Android smartphone. It’s actually a cloud storage app which comes with lots of file sharing features. The app uses WiFi to transfer files directly from device to device. Not just that, but Resilio Sync also encrypts all file during the transfer process and it never stores any file sharing details. So, Resilio Sync is another best file sharing app that you can use right now. 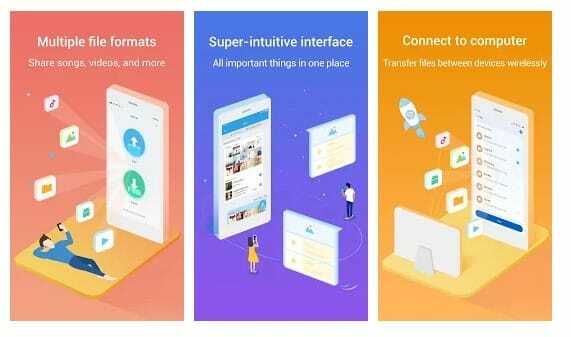 Mi Drop is a file sharing app which is developed by Xiaomi. The Google Play Store listing of the app says that Mi Drop is 200 times faster than Bluetooth and the highest speed goes up to 50MB/s. 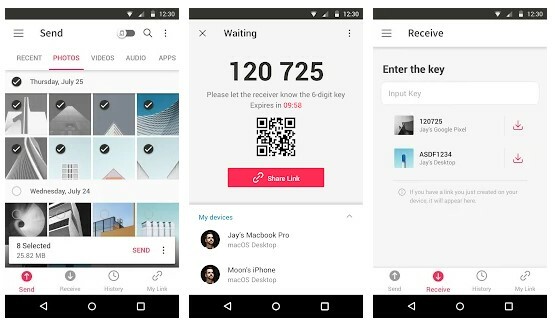 Just like all other file sharing app, Mi Drop also relies on WiFi to exchange files. Apart from that, Mi Drop can also resume interrupted transfers. Easy Share is another best WiFi P2P file transfer app for Android that you can use right now. The Google Play Store listing of Easy Share claims that the speed can go up to 20MB/ps while transferring files. Not just that, but Easy Share can also transfer the files to your PC by FTP server. Well, XShare is another best apps to transfer files over WiFi with high speed. The great thing about XShare is its QR code matching which makes XShare the most convenient file transfer tool. Apart from that, it was the user interface which makes XShare stand out from the crowd. So, XShare is another best file transfer app which you can use right now. So above is all about Best Apps To Transfer Files Over Wifi With High Speed On Android. 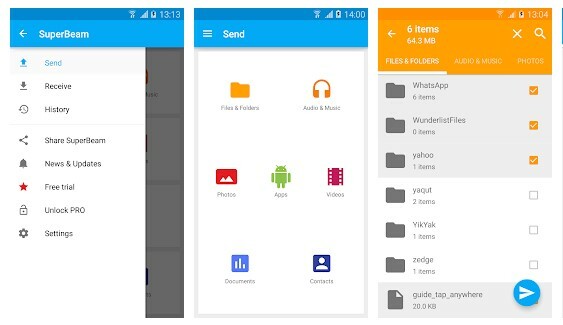 Using these apps, you can efficiently share large files in seconds between your Android device. Also, we have listed some apps that will allow you to transfer files from Android to iPhone and PC too. Hope you like the apps discussed above, do share these with others too. Leave a comment below if you have any related queries with this.